One bedroom, two bath partial ocean view fifth floor. New kitchen, bathrooms, floors, etc. Bright and cheery! Good walking, windsurfing, kitesurfing and whale watching property. A couple of minutes away from Kamaole Beach I, one of the great beaches on the sunny South shore. Air conditioning in living room and bedroom. Condo has a queen size bed and a sofa sleeper. Complimentary High Speed Internet plus wifi! Beautiful manicured lawn in front of the two Maui Sunset buildings with 5 floors each. Beautiful sunsets from lanai (patio). Enjoyed our stay. The view, swimming pool and hot tub plus the beach were excellent. The condo was nice and clean and well stocked with everything. The bed was not very comfortable. Maybe you should invest in a new mattress. Other than that I would recommend to anyone going to Maui to stay at Sunset condo's. Suite 502B was very clean. We did find the bed very hard and uncomfortable. The pull out couch was unusable for sleeping. The property management did not seem concerned that my two teenagers had to sleep on the floor. The after hours maintenance man was very accommodating and found us a blow-up mattress until he was able to replace the mattress. The unit had a cooler and beach towels which was very convenient. The unit had a very small supply of toilet paper, dishwasher soap, dish soap, and laundry soap so be prepared to supply your own. The location and grounds were great, but the individual unit 502B could use some updates. The mattress was poor, and the kitchen knives were practically useless. Aloha! Thank you for your comments and we will perform a complete walk thru and update whats needed! Our February stay at Maui Sunset. 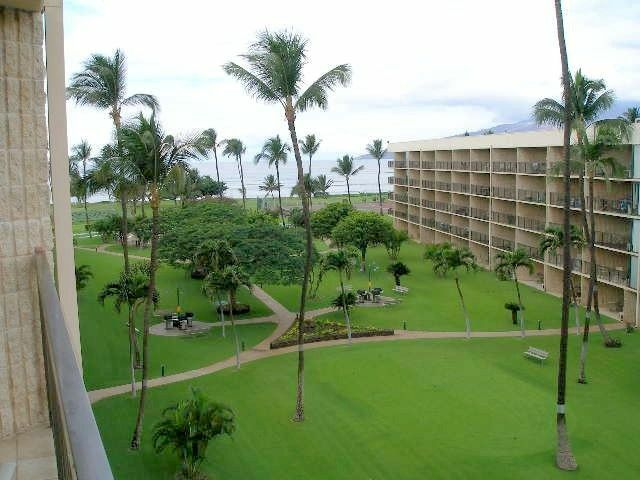 We really enjoyed staying at Maui Sunset with a great view of the ocean and the grounds are so immaculate. We have been coming back to Maui Sunset several years and each time have a different unit. They are always clean and have the essentials needed to start our vacation. The only thing missing was a larger skillet that my husband wanted to cook with so we purchased one. Overall it was perfect for our vacation. Aloha, Thank you for reviewing your stay at the Maui Sunset. We are very pleased that you enjoyed your stay and the property. Our office is happy to supply any missing items. We look forward to you future stay at the Maui Sunset. Kumulani Vacations & Realty, Inc.
First time staying here. The bedroom has a glass sliding door, not a window. Leaving that open during the day is not an option, and certainly not at night, as the door opens out to the hallway where everyone accesses their condo. Using the AC unit is a must in the bedroom because of this. View from door/window is of the stairwell door. The kitchen has been remodeled. Lots of dishes. I did run ALL the dishes through the dishwasher before we left, as the first 4 glasses I took from the cupboard had hardened SAND in the bottom. Did someone take them to the beach to make sandcastles? It is not the job of the maid to clean dishes, but the people renting the condo! We just hand washed any dishes we used while we were there. Small appliances, while we didn't use them, included a slow cooker, blender, rice cooker, and a coffee grinder. Lots of towels and extra sheets, but no beach towels supplied. Toys were minimal. 2 boogie boards, an umbrella and 2 beach chairs. Beach chairs need replacing. I did use one, but 2 of the 4 straps are missing. Washer/dryer in the unit, with soap for 1 load. They do ask that you stay in the condo when using the machine. In February the sun does not hit the lanai of this unit at any point during the day. Lanai furniture is adequate, and we ate out there every meal. The sofabed in the living room needs replacing. My daughter would not sleep on it, even with it on the floor. Too much metal in the mattress. She risked sleeping with a snoring mom rather than use that bed. Sitting on it isn't much better. Sink in the center, or lean to the middle if you sit on the ends. Two bathrooms in the condo, one is just a shower, one in the bedroom has a bath. The sink is in the main bedroom part, and that was handy. Great water pressure in the showers. Pool is big, lots of chairs and loungers. Always a cooler full of ice water there as well, and that was great. You do not get a code for the condo until arrival time. We had issues with our flight, and didn't arrive at the Maui Sunset until 3:30 in the morning. But we were able to find the black phone, and were very relieved to hear a voice at the other end, given the late hour. You need to register with the office in the morning though, and get a parking pass. Maui Sunset has a great program where you can take any leftover food to the office, and they donate it to charity. We moved into 502b after staying in a ground floor unit. Walking in to 502b felt like our vacation started all over again! My entire family was smiling and exploring like we had just arrived in a high end very expensive hotel! This unit was BEAUTIFUL! It has a modern kitchen and both bathrooms are redone with beautiful tiles. This unit is towards the far end of the building, so the view is of the entire manicured court yard all the way down to the ocean. The pros were the renovated condo! There were also stacks and stacks of towels!! There were 2 big closets in the master, one had lawn chairs and a boogie board. We added another boogie board.The kitchen was spotless and organized. The cons were minor- the kitchen equipment seemed more specific to a couple than for a family. They frying pans were smaller and there were no baking sheets. (We ended up purchasing foil bakeware and leaving it) There were only 2 plastic cups in the unit and no glass is allowed in the pool area. It would be nice if a set of plastic cups, bowls were added. There also were no metal BBQ utensils. The sofa bed in this unit was the biggest disappointment. It was so lumpy, and uncomfortable that it can hardly be called a bed. We ended up putting layers of towels on top of it to try and make it more comfy. (As the rest of this unit is spectacular, we really hope the owners will get a new sofa mattress) Our stay at the Maui Sunset was fantastic! The grounds are clean, safe and beautiful. We loved walking down to watch the sunset every night. I would recommend 502b. It was clean, very modern, bright and well organized!.